It takes a brave soul to attempt to piece together the shambles that is Doctor Who continuity. The task of bringing together often contradictory scraps of information across the shows fifty-plus years of history can, in the hands of someone with a unique perspective, an engaging manner, or interesting artistic choices transcend the arduous nature of the task in hand. The problem is, a lot of what we are told is largely familiar, and can feel gimmicky when both the writing and the artwork are not on their A game. Thankfully, The Whoniverse is more than up to the task. Both the writing and the artwork are compelling, well presented and engaging. It might confirm or deny certain prejudices when it comes to last year’s book-based offerings from the Beeb but, heck, I’ll say it anyway; the best thing about The Whoniverse are the gorgeous illustrations. Seriously, some of the nuWho sketches look like lost concept art from an alternative universe where Philip Hinchcliffe was showrunner for the Tenth and the Eleventh Doctor. It makes you wonder why artists Alex Fort, Richard Hardy, Chris J. Lees and Shaun Williams aren’t prominently featured on the cover. Along the way, The Whoniverse also explores the untold histories of other planets and other lifeforms as they have interacted with humanity. 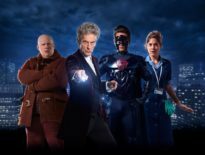 Apart from the Doctor, who is weirdly omitted due to the titular focus on the universe around him; leaving you to piece together where he interacted and in which incarnation – which is odd as he’s pretty much responsible for most of this! 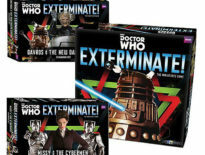 He’s also curiously absent from the illustrations despite the history of the Time Lords being covered and the Master featuring in a couple of pieces. 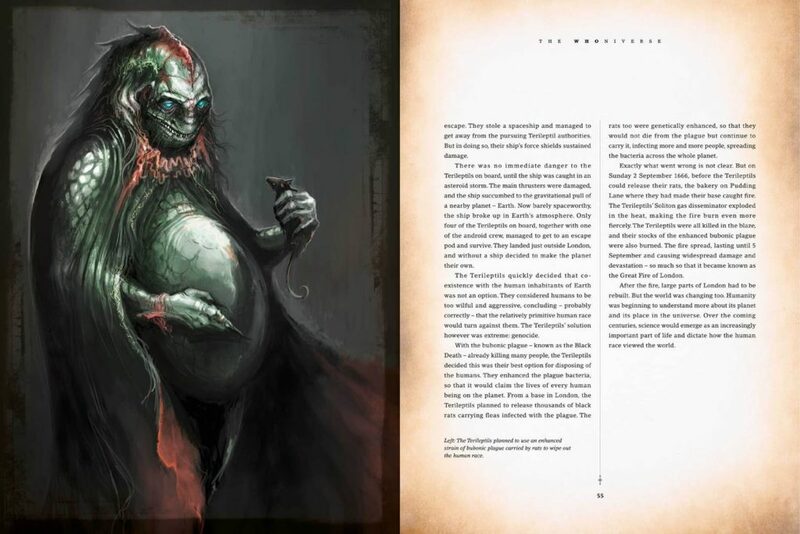 One other curious thing of note is that the book also uses concept art from the likes of Peter McKinstry but credits the some of the work to ‘BBC Copyright’ which not only sort of breaks the gossamer-thin premise that these are works by artists depicting events from historical texts – or perhaps religious texts, much like the classical paintings of lore – but it also means that if you own the impressive Impossible Worlds book, you now own some of the artwork twice. As a companion piece goes, they complement each other well. One builds a fabulous record of a fictional universe while the other lays down the pre-planning and planning that goes into bring those worlds to life. In fact, you may have found yourself reading Impossible Worlds and wondering what the likes of Alex Fort, Richard Hardy, Chris J. Lees et al might have made of some of the classic moments in Doctor Who’s history, well, wonder no more because here it is! If nothing else it offers a glimpse of what certain episodes would look like minus the budgetary constrictions. 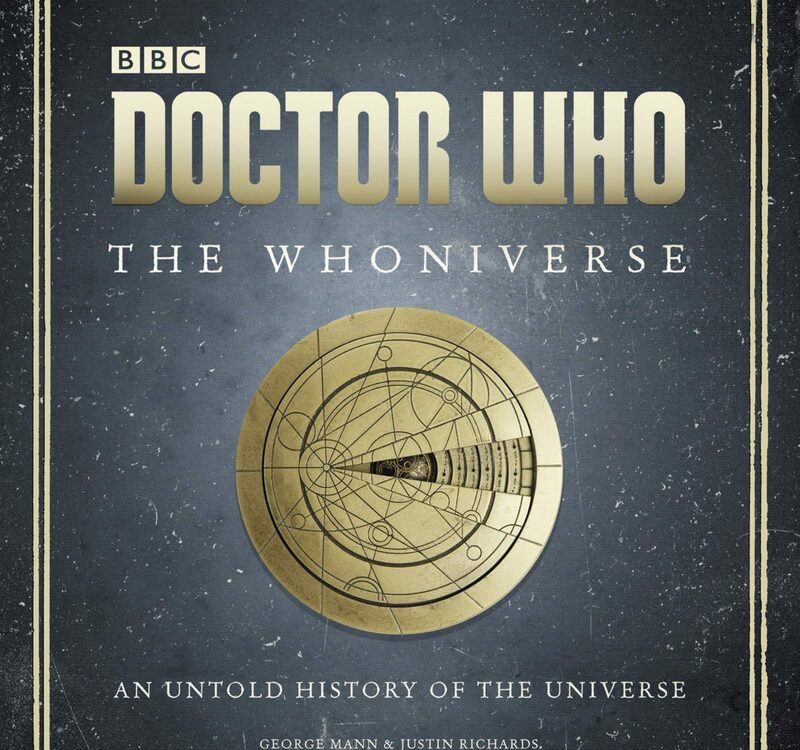 Although the text by George Mann and Justin Richards weaves a compelling narrative, it’s the imagination of the artists that really brings the untold history of the Whoniverse to life. A lot of what we are told here is largely familiar and a little dry but the text is well written and it does a fine job of transcending worlds and engaging us with the fictional worlds of the Doctor. 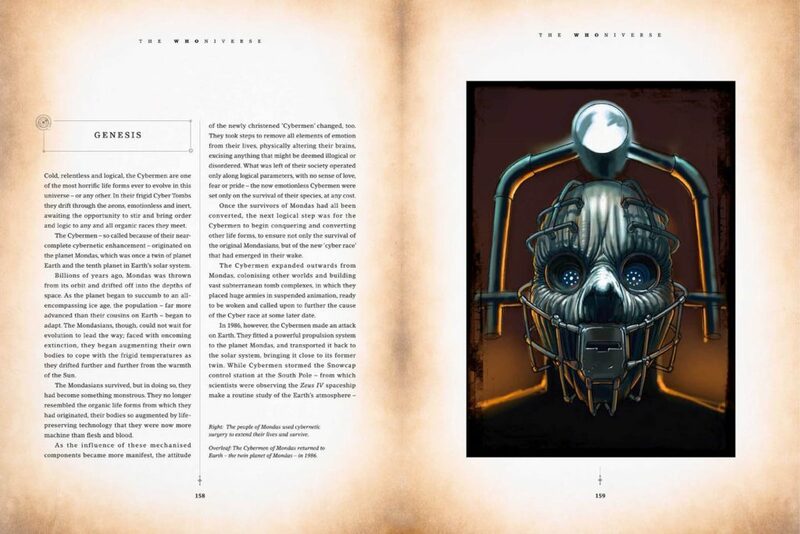 Artfully avoiding the trap of simply retelling facts like a bound edition of a Wiki page, The Whoniverse is a neat addition to the pantheon of Doctor Who reference books. The Whoniverse is available to buy now in hardback edition from Amazon for £17.94.